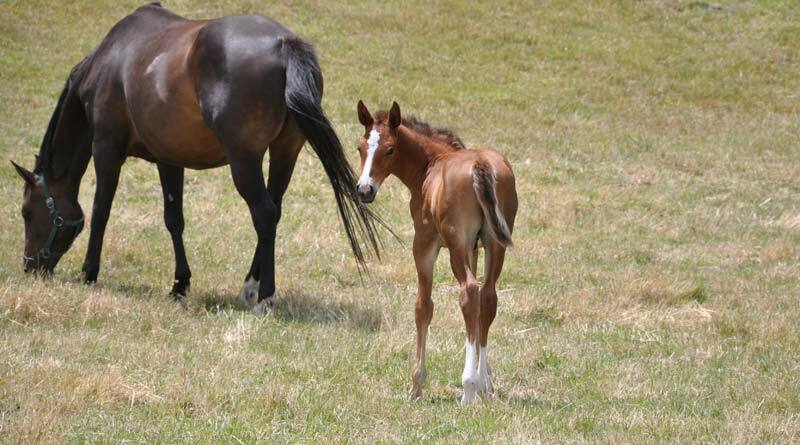 Researchers have charted the development of dynamic balance in foals, saying their findings will be useful for vets when looking to deal with problems in this area. Filipe Serra Bragança and his colleagues from Utrecht University in the Netherlands used 10 privately owned Royal Dutch Sport Horse foals, comprising five fillies and five colts, all of whom had been bred for showjumping. All were born and housed at the same stud farm and kept together with their mothers in a bedded stable. They had daily access to pasture. Throughout the study period, hoof development and conformation was normal, and no hoof trimming was performed. The researchers, who reported their findings in the Equine Veterinary Journal, used a pressure-plate system to collect data at walk and trot during the first 24 weeks of life. This information enabled them to quantify hoof balance asymmetry and to determine preferred landing strategies among the foals. The researchers found that dynamic hoof balance in newborn foals was more variable and less oriented towards the outside of the hoof and to the heel than in mature horses. The researchers, discussing their findings, said the study had confirmed their initial hypothesis that foals would show a relatively high variation in foot placement patterns that decreased over time. In young foals, there was relatively more loading towards the toe and towards the inside of the hoof than in mature horses. “The dynamic balance changes to be more like the mature horse within the first 24 weeks of life,” they continued. In general, variability among the horses decreased over time as expected, especially for medial-lateral (inside-outside) balance, although this was not the case for all parameters investigated. The researchers said newborn foals tended to splay their limbs, increasing the width of their base of support. This is thought to be a compensation for poor balance and muscle tone early in life. In the study population, mild deviations in conformation were also observed during the first few weeks of life. However, these were mild and resolved without treatment or farrier intervention. Photographs taken before each measurement reveal a gradual increase in hock straightness after birth, and it is more likely that the change in loading pattern is related to this phenomenon. “The toe‐heel balance shows less evolution over time and better resembles the situation in adult warmblood horses from the start. “During the first weeks, hindlimbs are relatively more loaded at the heel than front limbs. Especially at trot, there was a marked preference to start loading at the outside of the hoof; after that, loading becomes more even, with the hoof balance centring around zero and, at the end of the stance phase, the outside is again loaded more. This, they said, resembled the loading patterns described previously in adult warmblood horses. The study team observed significant side influences, with right limbs being loaded more on the outside than left limbs. They concluded: “In the foal, dynamic hoof balance is changing substantially in the first few weeks of life. The toe‐heel balance gradually shifts to the heel and the medial‐lateral balance to the outside. “This is accompanied by a gradual shift of landing preference in the same directions. “Variability in pressure distribution, especially of the medial‐lateral balance in the hindlimbs, decreased, which concurs with the decrease in the variability of some kinematic parameters in the same phase of life. B.M.C. Gorissen, F.M. Serra Bragança, C.F. Wolschrijn, W. Back, P.R. van Weeren. Equine Vet J. 2018 Nov;50(6):809-817. doi: 10.1111/evj.12961. Epub 2018 May 17.